I first learned about the 10x10 Style challenge when I was seven months pregnant and as big as a boat. Next time, I thought. Then in the spring it was literally the same week as my maternity leave was ending. The third time's the charm though because I'm finally on board to take on this challenge. So, what is the 10x10 Style challenge. Challenge creators, Caroline of Un-Fancy and Lee of the Style Bee each explain it well, including giving some tips to make the challenge work for you. However, in brief, it is this: You pick 10 items. You create 10 outfits for 10 different days.That's it. Simple, but complex. Above you can see what I chose, which includes 2 pairs of shoes, 3 tops, 3 pairs of shorts, 1 skirt, and 1 dress. From this I figure I can actually make about 13 outfits, if I so chose. Now, I've always been a fan of a fun challenge like this to push one's creativity boxes, but in truth, I've several goals for those challenge beyond just seeing what happens. Instead of being excited to get back to my pre-maternity clothing closet, five months postpartum, I'm still struggling with making my wardrobe feel relevant to this new season of my life. My body, while the weight is gone, is not the same as it once was. My clothes need to leave me free to do different things, and my moods are different. I'd like clothes that express those changes, but like most people can't go out and buy all an new closet of clothes. So, I want this challenge to help reteach me about the clothes I already do have. Rather than going with jus basics and one or may be two pops of color, as was suggested for this challenge, I gathered some of my favorite items and will be pairing them together to see what works. 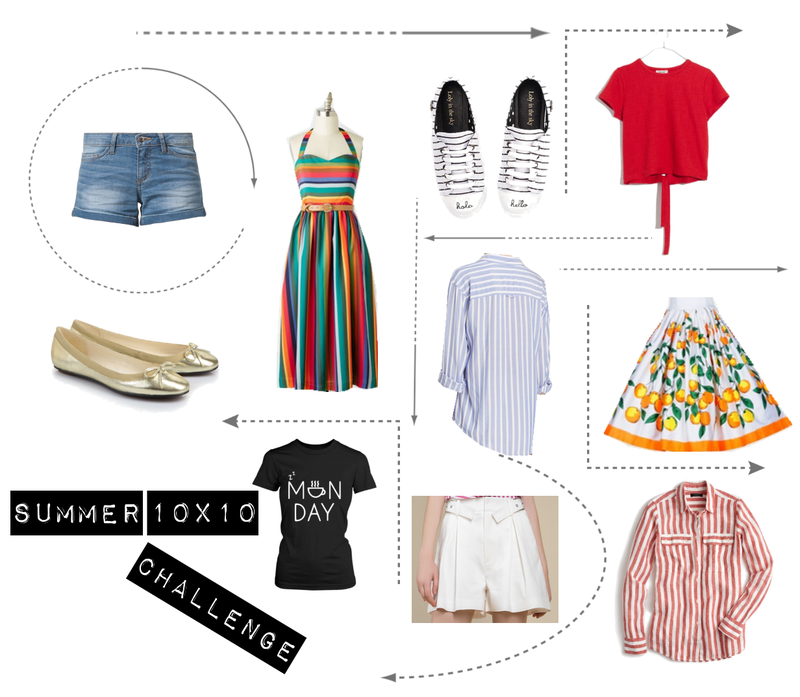 If you want to see more about the 10x10 challenge, or see what I am wearing for it, you can follow along on Instagram by looking at the #summer10x10challenge #unfancyremix or #10x10stylebee . Let me know if you're trying it too; I wanna see what you can do! Sounds like a great challenge, and I love the striped sundress!